This squirrel has become semi legendary here at nutsaboutsquirrels. This squirrel is not easy to approach and has an unusually large territory. The first few times I spotted her in the yard of a corner house about two blocks from ours. After that I started spotting her everywhere over a four by four block radius. She has been around since at least 2008, maybe earlier. She will occasionally visit our yard, but not on a regular basis. This squirrel is completely heedless of traffic. She has been seen crossing the street, changing her mind, then crossing right back. She sometimes runs lengthwise down the street. Because there can be long stretches between sightings, I always find it satisfying when I spot her again and realize that she is still around. She has become one of those fixtures of the neighbourhood that provides a sense of continuity. Lately though, we have been seeing her on a more regular basis, so maybe we’ll get some better pictures of her. This entry was posted in White Tail. Bookmark the permalink. I live in Mooresville, Indiana and I have a white tailed squirrel in my oak tree in my front yard. 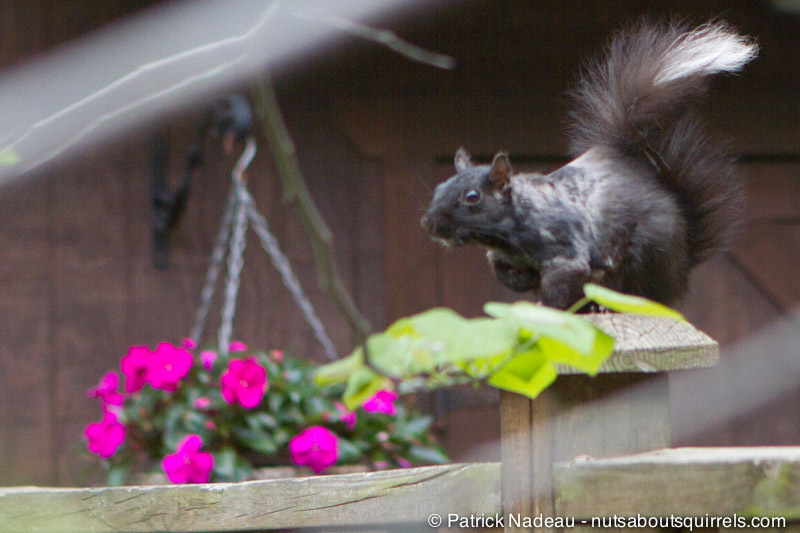 It is a very daring little one who sits under the bird feeder collecting the seeds the birds discard. Where we live, the white tail squirrels seem to occur in a specific area. There’s been a bunch of them, several generations, breeding just to the south-west of us. You may also like this video of one of those white tailed squirrels gathering nesting material. I live on Cape Cod and saw a white tailed squirrel this am. I have never seen one here before. i live in Regina, Saskatchewan,[Canada] and before now have never seen a white-tailed squirrel before a few days ago. Since then, I’ve seen two….both on the same city block. Regina has its share of regular brown and brownish-grey squirrels, but these little guys seem to be quite unique, and a new addition to the population.